Ankita Sengupta is no ordinary woman. On the outside, this 24-year-old resident of Kolkata who works at Prantakatha, a youth NGO, may appear like the girl next door. But there’s more to her than that. Passionate about working with people, Ankita participated in the first edition of Samvidhan LIVE! The Jagrik Project, a public initiative started by ComMutiny - The Youth Collective. As a participant in this project, Ankita became a Jagrik (active citizen) and undertook a 5-week learning journey to understand the values of the Indian Constitution. She played a real-life interactive game, played by 500 other Jagriks across the country, who brought alive the Constitution in their neighbourhood by doing 1500 social and self-action tasks in a matter of 5 weeks. As a result, they fared way better on a test on constitutional awareness as compared to 18,000 respondents from different parts of the country, who flunked the test! This year, the second edition of Samvidhan LIVE! The Jagrik Project is back again. We recently chatted with Ankita about how she spent a night under a busy flyover and how she managed to persuade the local authorities to make a women’s toilet in the area. What motivated you to participate in the Jagrik journey? My organisation Prantakatha asked me if I’d like to participate in the Samvidhan LIVE! The Jagrik Project and introduced the concept to me. Before that, I had learnt different aspects of the Indian Constitution but that was only through textbooks. I’m passionate about learning and I wanted to understand the Constitution in a fun way. This is what motivated me to participate in Samvidhan LIVE!. What was your understanding of the Indian Constitution, before you undertook the Jagrik journey? Before the Jagrik journey, I knew simple facts like Dr. B.R Ambedkar played an important role in forming the Constitution. I knew that all the rights of a citizen are mentioned in the Constitution. But I was missing its in-depth understanding. I had never discussed its importance with anybody in my life, ever before. At a personal level, the Constitution was not ‘alive’ for me. Did you find any of the tasks challenging because you’re a woman? I come from a very conservative family where my parents insist on making the choices about my education and career. I had to struggle a lot to study social work and I’m still struggling. When I told my parents that I was going to do the tasks from The Jagrik Project, they got furious and asked me not to participate. They reminded me that I was a girl and I would face a lot of problems. One of the tasks I did, along with my partner, was to stay overnight under a flyover, which was a task under the Right Against Exploitation. The task was to go to a slum cluster, spend some time there and identify the exploitation happening there. We went to the Gariahat flyover in Kolkata. There was a community of about 50-60 people, including 15 children, living under the flyover. The community is a mix of Hindu and Muslim people belonging to marginalised communities from West Bengal. After going there a couple of times in the mornings, I could only see things happening on the surface. I knew something was happening but I wasn’t able to put my finger on it. 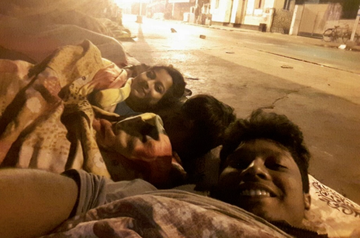 Being a woman, it was a big challenge for me to sleep on the pavement next to an open busy road. I found out that there was no toilet around and the women and young girls who live there have to go to the ‘pay and use’ toilet very early in the morning. At night, they can’t use a toilet, so they have to hold it. They even have to change their clothes in the open! My partner, who was a man, had it easy - he could urinate next to the roadside. Society doesn’t approve of women urinating by the roadside. As a woman, it was very difficult for me to relieve myself. This situation made me empathise with women and young girls who have no access to safe and clean toilets for long periods of time. It was very painful for me to see how homeless people have no safety, let alone access to a toilet. Despite all these sad realisations, this task was my favourite and I did enjoy the good parts of it. What was the reaction of the community under the flyover towards you? How were they being exploited? Though the community under the Gariahat flyover is very poor, they were generous and welcomed us. They even brought two kinds of dinner for us - treating us like guests! Ankita & Sourav eating dinner under the flyover. This small community lives in the parking area under the flyover. The adults earn their living as rag pickers and by working in nearby shops. But the children were also begging to make money. They were being sent by their parents to beg and after they realised that they could use the money, they continued begging. The children also told us how they were being cheated by people who got their shoes polished from them outside the temple but didn’t pay them any money. Can you elaborate on your experience of sleeping under the flyover? When I started the task, I was very uncomfortable as I had no clue what would happen at night. The parking area, where the community lives, is functional from 9 AM to 10 PM. Once the cars leave, the community prepares the parking lot for sleeping. I attracted lots of curious glances from nearby shopkeepers and passersby, while I was there at night preparing to sleep. Ankita sleeping under the flyover. I had a long talk with the children who live under the flyover that night. I found out about the kind of exploitation they face. After I had eaten and spoken to the children, I felt better. My partner could not sleep at all but I did fall asleep. A random truck stopped right next to us at 4 AM in the morning for 20-25 minutes and my partner woke me up. We both wondered why the truck had stopped and it made us anxious. At some point, I saw rats running past me while I was lying down! I was scared that they would come near me. Also, I could hear a lot of noise of trucks and vehicles moving overhead on the flyover and that made me uncomfortable too. I went off to sleep later and in the morning when I opened my eyes, I saw that many people were catching the bus and running beside me while I was lying on the pavement. They were looking down at me. The men were looking at me in a disrespectful way and I realised that this also happens with other women who sleep on the streets. What was your other favourite task in the Jagrik journey? There was a task under Fundamental Duties and the idea was to break a gender discrimination pattern. There is a wall outside the Ballygunge station near my office and I noticed that it said, ‘Do not urinate here or else you’ll be fined’. I noticed many men urinating in front of this wall, despite the sign. And nobody was saying anything to them, not even the Ballygunge station master! So, I planned a small social experiment and made a video with my partner. The video shows me sitting and urinating beside the men next to the wall with the sign. It captures the shocked reactions of men who could not believe that a woman could urinate in the open just like them. This shows the patriarchal attitude of our society which allows men to do anything they like but eyebrows are raised when women do similar things. After shooting the video, I confronted the men who were staring at me and had a discussion with them. It was during this time that I found out that there was no toilet in the Ballygunge station area. One has to walk a long distance to get to the nearest toilet. Even though a year has passed since I did these tasks, they gave me the strength to confront gender inequality. What action did you take after completing these two tasks? After sleeping under the flyover, the next day I had a discussion with the parents about why they were sending their children to beg and convinced them to send them to school instead. The parents explained that they were very poor and if the begging wouldn’t continue, they wouldn’t have enough to eat. After I convinced the parents to send their children to school, I promised to help them with admitting their young girls in the local school nearby. My partner and I went to the local government school and requested them to admit the girls. The headmistress refused to take the kids in because they come from a slum. We reminded her about the Right to Education and persuaded her to admit them to the school. Ankita got the girls admitted in the local school. Girls from Gariahat slum in their new school uniform. After discovering that there was no women’s toilet near the Ballygunge station, I talked to the local councillor and MLA and showed them the video I made, to explain how women struggle with access to toilets in our society. They agreed with me and decided to take a positive step by making a women’s toilet in this area. The new toilet can be used for free and is within a 5-7 minute walking distance of Gariahat flyover. I went and told the community about the new toilet and some of the members are using it now. Another young person Sobhan Mukherjee, who is 21 years old and connected with Prantakatha, got inspired by my Jagrik journey. He started a social initiative called Tridhara through which he made public toilets for transgender people in Kolkata. He also started a new venture called Bandhan that provides free sanitary napkins to women in public toilets. Did you tell your family about the tasks you did during the Jagrik journey? No, when I went to spend a night under the Gariahat flyover, I told my family that I had a task to do at the flyover during the day and that I would go to the office later that night to sleep. If I had told them the truth, they would have never allowed me to do the task. But later, they learnt the truth when I was invited to speak at Lok Sabha TV and after I appeared in media interviews. What has changed for you after the Jagrik journey? The night I spent under the flyover changed me because it gave me tremendous inner strength. I can take clear decisions for myself now. I learnt how to communicate effectively. I feel more confident in dealing with people, mobilising a community and looking for solutions together. This year, I am going to be a Jagrik facilitator and guide other youth who are Jagriks. I get to share the lessons I learnt with them. I remind them to focus on learning rather than competing with each other while having fun. I’m also planning to do fieldwork and see how they’re doing their tasks. What is your message for women citizens as a Jagrik? Every woman should understand and explore her inner self. She should find out what she actually wants. My message is simple - be independent in every way you can. We can empower ourselves by making our own decisions that will help us grow in our own way. And always remember, the Indian Constitution has given you rights and duties, so you can create your own life. This interview was conducted by Vandana K for ComMutiny The Youth Collective (CYC). To follow all the action from this year’s Samvidhan LIVE! campaign, follow CYC on Facebook. If you would like to support Samvidhan LIVE! through a donation, check the fundraising page Do we know our Constitution? A Reality Check on Ketto.